A Thai beach made famous by the 2000 Leonardo DiCaprio movie The Beach will stay closed indefinitely to give its ecosystem time to recover, authorities said on Tuesday. 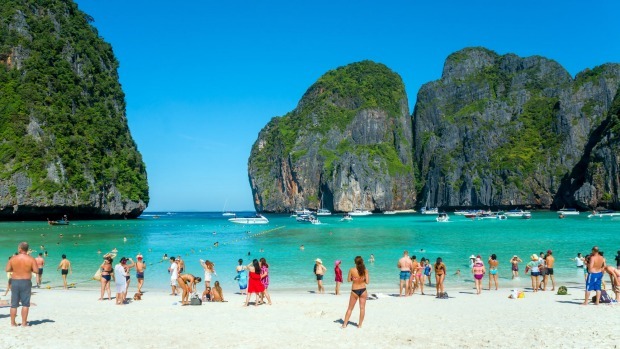 Up to 6000 visitors had gone to the beach every day, travelling by speedboat from the nearby resort islands of Phi Phi and Phuket and Krabi on the mainland. "Four months' closure was not enough," Songtham Sukswang, the director of the Office of National Parks, said. Tourism makes up about 12 per cent of Thailand's economy, but there has been growing concern about the country's ability to manage its rapidly growing number of visitors. But new figures show Chinese tourist arrivals in Thailand are tumbling, dragging down overall visitor growth in the Southeast Asian nation and dimming the outlook for an economy that relies on spending by holidaymakers. Travellers from China slid 12 per cent in August, the biggest drop in more than a year, keeping the overall pace of visitor growth near a 16-month low. Thai officials are rattled as Chinese visitors are the top source of foreign receipts in an industry that makes up about a fifth of the economy. The trigger for the drop was a tour boat accident off Phuket in July that killed dozens of Chinese holidaymakers, sparking safety concerns. Thailand's image in China has also been hurt by a dengue outbreak, the strength of the baht and, most recently, a viral video of an airport guard apparently punching a Chinese tourist. 'The negative growth in Chinese arrivals is a downside risk in the second half of 2018,' said Kampon Adireksombat, the chief economist at Kasikorn Securities Pcl in Bangkok. The tourism slowdown and the impact of global trade disputes will cut Thai economic growth to 4.2 per cent next year from an estimated 4.5 percent in 2018, he said. The Thai military government this week moved to limit the damage from the video of the attack on the Chinese tourist, saying on Twitter that Prime Minister Prayuth Chan-Ocha regrets the incident -- underlining the administration's sensitivity to bad press on the mainland. The tourism sector has a history of bouncing back from setbacks. The Bank of Thailand expects arrivals to improve and anticipates over 38 million visitors this year -- equivalent to more than half the Thai population. Other government figures estimate that Chinese travellers contribute close to a third of 2.09 trillion baht ($90 billion) in foreign tourism revenue. Tourism trade bodies are urging the government to take steps such as temporarily providing double-entry visas or visa-free travel to Chinese visitors. Investors are fretting too: the Stock Exchange of Thailand Tourism & Leisure Index is down 14 per cent this year, compared with a 0.3 per cent decline in the overall stock market. For all the challenges, overall arrivals continue to expand: Bangkok is the world's most visited city, and the beach resorts of Krabi and Phuket lure travellers from all over the world. But the nation has to act quickly to restore the confidence of Chinese travellers, said Vichit Prakobkosol, the president of the Association of Thai Travel Agents.